The Irish university lecturer who was killed in Paris this week had strong links to Donegal and was a frequent visitor to the county where he owned a holiday cottage. As news emerged on Thursday morning of the tragic death in Paris of John Dowling, there was deep shock among the many people who knew him, particularly the community in the Donegal Town area. John died after a violent knife attack as he was returning from his lunch outside the Leonard de Vinci private university in Paris. The late Mr. Dowling was a member of Donegal Town Rugby Club in the club’s early years and had remained a very frequent visitor to the town where he still retained his little holiday cottage in Finnmore in Leghowney. Indeed as he was nearing retirement it was his firm intention to return to visit the cottage more regularly. Another club member, Trevor Johnston, issued the following appreciation on behalf of the club earlier, “It is with profound regret that Donegal Rugby Club records the tragic death of John Dowling in Paris. The older generation of the club will have a rich store of memories of John as he was a prominent member of the club in the 1970’s. “John came from the Palmerston area of Dublin and played his early rugby for De La Salle Palmerston (DLSP). He came to Donegal to write and lived up in Finnmore, Leghowney in a small cottage with his partner. 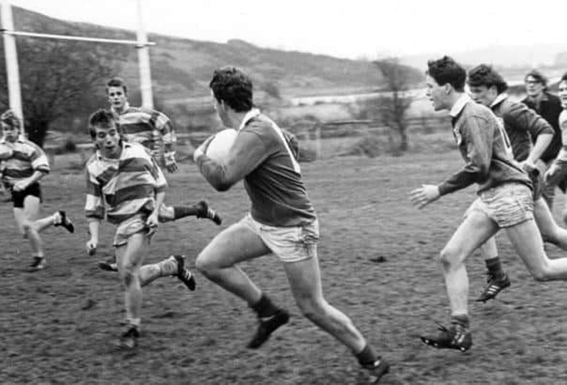 “When Donegal Rugby club was formed, John became our unofficial coach and brought a level of specialism to the role that was previously lacking. He latterly became our under 18’s coach and brought the kids on regular trips to Dublin to rugby matches. Our senior team played its first ever tour match against DLSP and John was a very proud man that day. “His brother Derek played in the front row for Leinster and I know John took great joy from Derek’s achievements on the rugby pitch. “A skilful and athletic out half John was a fierce competitor on the pitch but off the field he was a quiet and friendly man. I can still see John zooming down the road to training on his Honda 50. “John has been working in Paris for a number of years and returned each year to Dublin where he taught for the summer months. “He always described himself as a swallow as he came home every year. His strong links to Donegal remained in place as he kept his holiday house there. “Tributes to John have been many and he has been described as a kind, respectable and gentle man. As French police continue their investigations into the incident, police said a 37-year-old man, who is a Pakistani citizen, has been detained.